Allow me to begin with my ecclesiastical historian’s hat on. 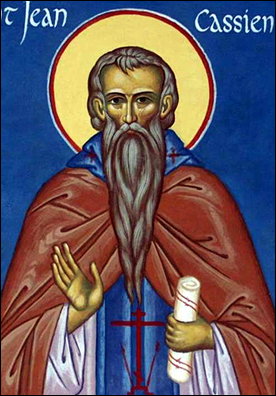 The second selection from John Cassian in The Philokalia (the first having been about the 8 thoughts, taken from Books 5-8 of The Institutes) is taken from Cassian’s second work, the much longer Conferences or Collationes. The Conferences purport to be the monastic elder’s encounters and conversations from the approximately ten years he and his companion Germanus spent amongst the Desert Fathers of Egypt, adapted for the situation in Gaul and possibly falsely recalled due to the faults of human memory (which he admits). Germanus is the usual interlocutor with Cassian sitting and listening in silence. An argument was made somewhere that here we find the full depth of Cassian’s spiritual theology. Here we certainly meet some his more powerful concepts, and the influence of Evagrius of Pontus, quite palpable in his discussion of the eight thoughts in The Institutes, continues. We’ll get to that in a moment. The Conferences are available online, as well as in an excellent translation with helpful notes by Boniface Ramsey. Ramsey also translated The Institutes. The first Conference is where Sts Nikodimos of the Holy Mountain and Makarios of Corinth gathered the opening material for ‘On the Holy Fathers of Sketis and on Discrimination’. The discussion is created of various excerpts from Conference 1, seamlessly woven together, ending with the paragraph on p. 98 of the English, ‘When the old man saw us marvelling at this…’ In Cassian’s original, the paragraph is used as a way of ending the conference with Abba Moses that day, whereas in its reworked Greek version, it becomes the segue into a discussion of discernment. The rest of ‘On the Holy Fathers of Sketis’ is a discussion of discernment/discretion taken from Conference 2. Both Conference 1 and 2 are with the same abba, Moses. I do not know if we are to assume that he is the same Abba Moses in the Sayings of the Desert Fathers or not. Throughout both Conferences we encounter an array of biblical verses, examples of biblical persons, and examples from the history of Christian asceticism. Tell me, what was your purpose and what goal did you set before yourselves in doing all this [ascetic labour]? In the Latin, Cassian actually uses the Greek scopos and telos. Scopos is glossed as destinatio (which is admissible in this discussion in its English descendant); telos is finis (or end). Clearing the field is the farmer’s scopos, enjoying its fruits is his telos. The scopos, or finis, of the ascetic life is the kingdom of heaven — regnum caelorum. In their English translation of the Greek Philokalia, Palmer, et al., give us purpose for scopos and goal for telos. Abba Moses then says that love of God and of human beings, not ascetic labour, is the purpose. This is the great recurring theme of Christian spirituality, as I have discussed here in the past in relation to St Augustine and the Cistercians. From here, Abba Moses discusses how to achieve purity of heart; as Cassian and Germanus discuss the ascetic life with other Egyptian abbas, they learn more and more; there is a rising up towards this purity, found in the pure prayer of Conference 10 which leads into a discussion of perfection itself in Conference 11. In The Philokalia, Abba Moses gives some attention to the thoughts (those Evagrian logismoi) before moving into his discussion of discernment. You can see, I think, why The Conferences make me aware of my inadequacies! I still have no grand answers for questions of how a modern layperson, married, working full-time in a demanding job, is to pursue purity of heart. I guess thinking about it is a start. Praying daily as we do at The Witness Cloud is, undoubtedly, central. Abba Moses counsels Cassian and Germanus to keep their eyes fixed on the knowable actions of God in creation, Scripture, the deeds of the saints. I guess being an ecclesiastical historian might actually give me some advantage, then?